As sweet as cinnamon: Homespun and Update! a special something for my favorite magazine. for your mum in time for Mothers day, or for yourself. on it but I can show you the cover to look out for. The cover is very pretty and has some great designs in it. There is also a design from my fellow Gum Tree designer Vikki. BOM 'Life is a celebration' . for the missionaries Mark and Christine. Its for all of the sales up to 1st of April for the Baseco Tote. purchased the Tote Bag pattern. towards the poor in Baseco. I appreciate everyones help so far. 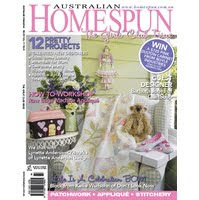 I can't wait for homespun to arrive! Good job on your efforts to help people in need! I'll certainly be looking out for Homespun now! Oooh, congratulations on having a design in a major magazine. How exciting. And yes, the cover of that mag is lovely...right up my alley. Keep up the good work for the charity, Dawn. My Open House for the end of this month got cancelled, so I'll be contacting you soon to just give a donation! Yay for Homespun - and how lovely to raise so much, Dawn, praying you meet your goal! What an amazing achievement collecting so much money for such a wonderful cause. Congratulations and good luck on reaching your target. Do you want EQ7?...it's coming soon! A Mothers Day gift for you to make! Do you like red Allie? Another version of Lesley's Peg Bag! Gardening and some Faraway mail! Easter bunny left a Fishy!